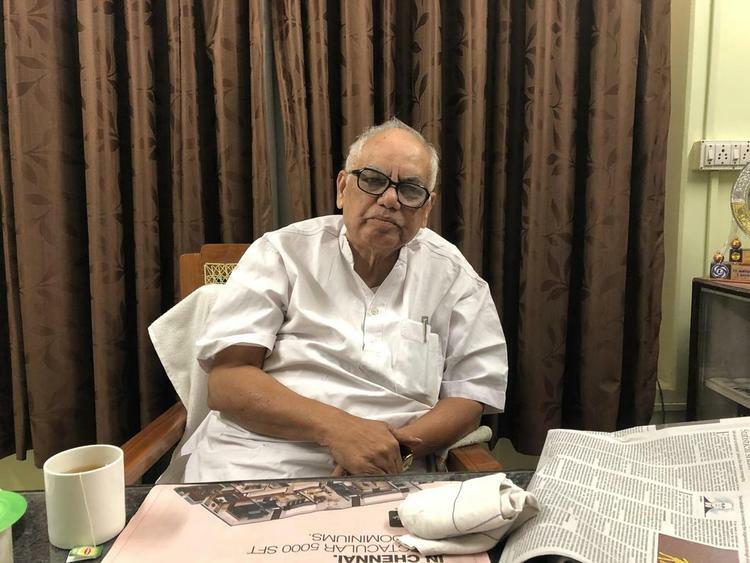 When I accepted the invitation to speak at a seminar in Chennai, I realised that an opportunity was presented on a platter to me – I wanted to interview Mr R Kuchelan, respectfully called Kuchelar in Tamil Nadu. My visit to Chennai would allow me enough time to meet him. 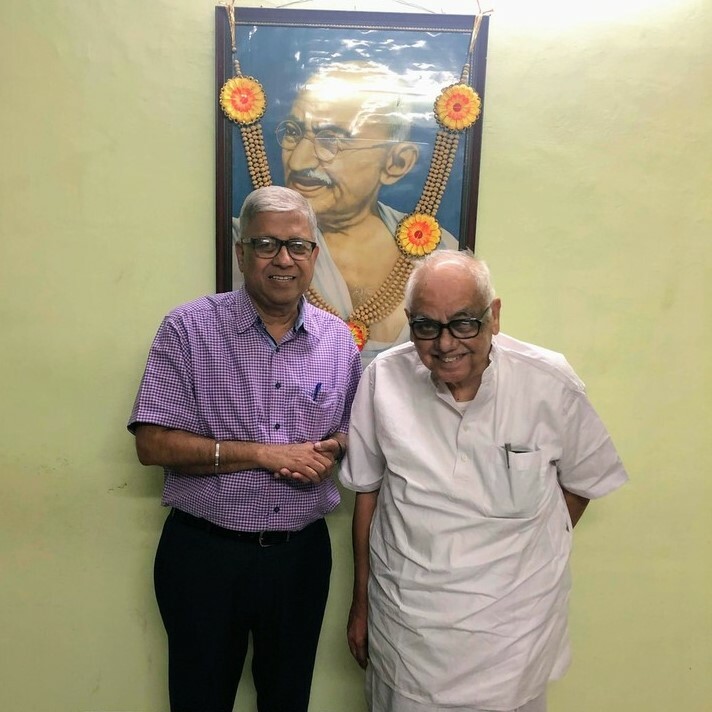 Dr. EA Ramaswamy’s book ‘Worker Consciousness and Trade Union Response’ was published in 1988, the year in which I assumed responsibility for industrial relations at the corporate level in the organisation where I worked. This book covered industrial relations in Bombay, Madras, Bangalore and Calcutta (as these cities were called then). I had decided to survey industrial relations in the states where my employers had set up factories. So, the book was useful for me. My interest in the industrial relations at Madras grew because I had met a senior Personnel functionary of the Simpson group where much drama mentioned in the book had taken place. Kuchelar was frequently mentioned by some as ‘Datta Samant of Madras’ and coincidentally Ramaswamy too described him so in the book. I called up Kuchelar’s office (in 1988) but could not get his appointment, and then the matter went into ‘cold storage.’ With Chennai visit I decided to complete this long pending desire to meet him. Two messages asking for his office address were unanswered. It looked that I would not be able to meet him, so I decided to call him up. He picked up the phone, I spoke to him and he gave me office address; I was on my way immediately. 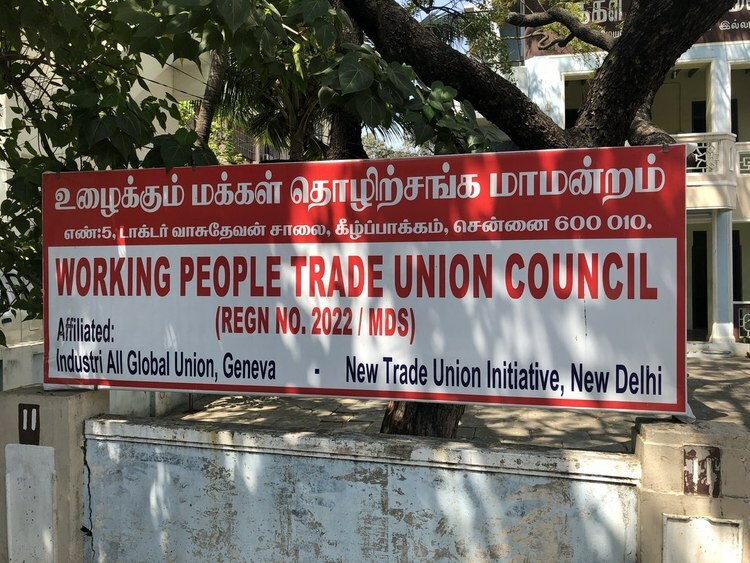 A small compound wall carried the signboard of Working People Trade Union Council. Its office is on the ground floor of a two-storey building with a good open space in the front. I was taken to meet Mr R Kuchelan. The layout was so typical of houses in Chennai. Kuchelar was sitting alone behind a table at the end of a rectangular room. A closed window behind him was covered by a large curtain. A garland adorned the large picture frame of Gandhiji on the wall to his right. It was quite in contrast to the image I carried of him. Kuchelar wore a simple white kurta, the kind we usually see old Gujarati men wear at home or in a shop. At first instance I could not guess his age correctly, he looked about seventy-five, but later discovered that he was eighty-three. Inquisitive eyes behind a small spectacle frame showed he was full of life. The Economic Times lying on table and also his mobile covered in a golden coloured cover. It was a large table. On his left was a book rack with few books and some papers. I introduced myself, and mentioned my interest in industrial relations. “How do you see the present state of industrial relations?” I asked. We discussed industrial relations in Tamil Nadu, actually in Madras as it was called, now Chennai. Kuchelar dived deep into the history. “True. The Trade Union Act allowed union to be formed if you have seven members. This has created multiplicity of trade unions everywhere.” Kuchelar was clearly on the nostalgia trip. “Madras has always had leader-centred unions. Singarvel Chettiar was the first leader to celebrate the May-Day, later the Labour Day. He was the founder-leader of the communist party in India and was implicated in the Kanpur Bolshevik Conspiracy case. He was an advocate. I understood the situation. Just before the globalisation the situation was no different. Yes, he said. Kuchelar laughed aloud. Kuchelar laughs easily. He was not the serious man I imagined he would be. Here was a person who had seen such terrible violence, who has been a victim of violence – and reportedly he had instigated some violence; I was amused by his laughter. And he has a child-like laughter which signifies innocence. Can one attribute innocence to him? To me it was a sign that he was able to look at things dispassionately today. There was a long silence. “In 1972 I became the President of the Madras Labour Union. In 1996 Binny was inundated with floods. They closed down. They sold a part of the land property and paid compensation to employees. The part retained by them is worth one lakh crore rupees today.” He laughed again. It was a derisive laughter. Kuchelar appeared to have led a life which he is proud of. He is particularly proud of his well-educated children, and grandchildren. I had seen Kuchelar delivering a speech in the conference of IndustriAll at Pune. I wanted to meet him but somehow could not manage it. The two hours spent with him gave me a glimpse of this firebrand trade union leader. He presented me a copy of his book. I could not read its title. I was told that it means ‘Its Kurukshetra again.” Like the personalities in Mahabharat, he remains a controversial figure. Dr EA Ramaswamy’s book suggests that Kuchelar was autocratic, and even mentions the allegations of corruption against him. Yet I think it takes great leadership to win election at the age of eighty-three and lead the Ashok Leyland workers. See this news report published on Dec 3, 2018. (R Kuchelar team wins Ashok Leyland Employees Union elections in a close race). Today he heads unions in not only Ashok Leyland [three units] but also in the Simpson Group, Rane Group, Ucal Fuel Systems – Kuchelar calls it ‘that company of Krishnamurthy of Maruti Suzuki, GE – formerly Alsthom, L&T Alcover, NCRCorporation (ATM Mfg Company), LMW Group, Amrutanjan Balm. His union ‘Working People Trade Union Council is affiliated to NTUI and IndustriAll, the latter is a global union. When I look back at the life story of a leader who has made his foot print on the sands of time, I am amazed at the sheer will to create an impact, I feel surprised at the contradictions in their action and life. I think Mark Twain has summed it up well when he says, “There are those who would misteach us that to stick in a rut is consistency, and a virtue, and that to climb out of the rut is inconsistency, and a vice.” Well, climb out of rut Kuchelar did. And we can safely say that it is an extra-ordinary life. Interesting history of Industrial Relations and the Leader, Shri. Kuchelar. Nice to hear from him when he says “Direct conflict is a no-no. We must cooperate with the organisations, otherwise business will be lost and competitors will take over. That is not good.”. Person of high degree of integrity with workers social development is introduced to people of industrial relation,thanks to Vivek.